MIUI 8.2.2.0 Global Stable ROM is finally available for the Xiaomi Redmi Note 3 phone. The new update comes with lots of new bug fixes, Features, and improvements. You can download the latest version of MIUI 8.2.2.0 for Redmi Note 3 from below. The MIUI 8.2.2.0 Global Stable ROM for Redmi Note 3 is available via the OTA method and most of the user already received this new update on their phone. But you can flash the same manually on your phone without waiting for the OTA update. All you have to Download Latest MIUI 8.2.2.0 Global Stable ROM on Redmi Note 3 and flash the same on your phone with recovery or fast boat method. 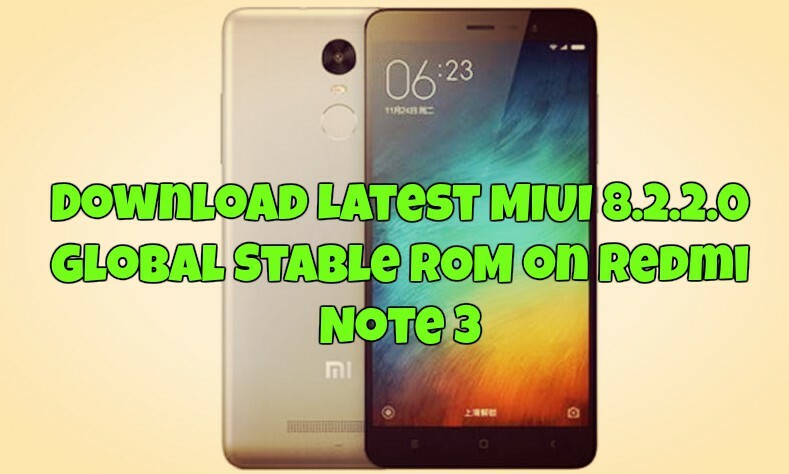 If you don’t know how to install this new official MIUI 8.2.2.0 Global Stable ROM on Redmi Note 3, below is the guide which you follow on your phone and update the same with this new latest MIUI 8 update. This guide is only for the Xiaomi Redmi Note 3 users and don’t follow this method on any other xiaomi phones. Otherwise, you will brick your phone. NOTE: lets- Technobuzz.net is not responsible for any damage that might happen to your phone during this process. Read All the steps very carefully and follow all of them step by step on your phone. Let us get started and update Redmi Note 3 to MIUI 8.2.2.0 manually. Before following the guide lets take a look at the features of the MIUI 8.2.2.0 for Redmi Note 3. The process is simple and all it takes a few minutes to complete the whole process. There are two methods which you can follow on your Redmi Note 3. First is the recovery Methos and the Second one is the Fastboot Method. To do this use the below method to install the MIUI 8 update on your device. This is the best way to download and install MIUI 8.2.2.0 Global Stable ROM for Redmi Note 3 and flash it. Comment below if you have any questions.